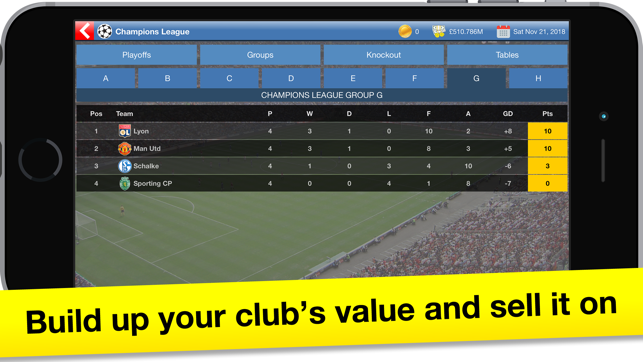 Forget being just a football manager – buy the whole club and lead it to glory in this addictive soccer strategy game. 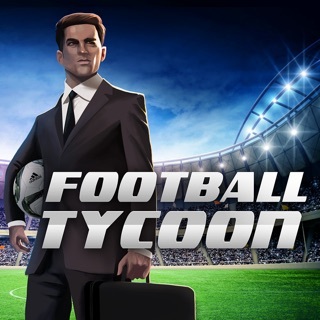 You are a business tycoon who wants to get into the world of football. You start off with enough money to buy a small club and take full control of it. You must buy and sell players, hire and fire staff and develop your stadium as you strive to climb the leagues and win trophies. There are 750 clubs to own across 9 European countries including England, Spain, Germany, Italy, France, Russia, Portugal, Turkey and the Netherlands. 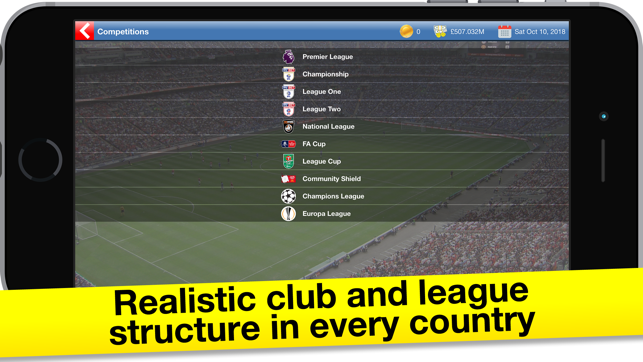 Each country has realistic league and cup competitions, meaning there are 64 trophies to compete for in total – how much silverware can you win?! 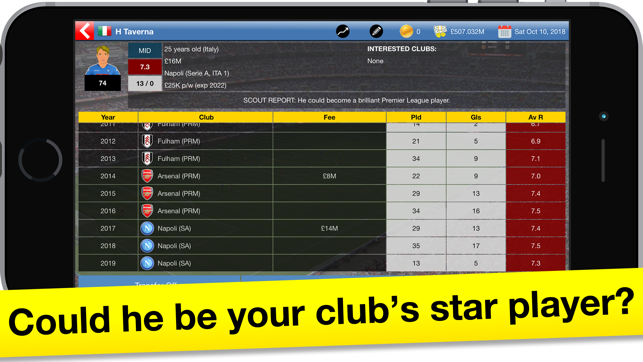 There are 17,000 players in the game and your scouts will regularly provide reports on as many as they can. Make offers to buy or loan them, using your business acumen to negotiate transfer fees and personal terms. You’ll be in control of player sales too – will you accept that big offer for your star player? Build up the value of your club in order to sell it and buy a better one. Or stick with your original club and take it all the way to European glory! 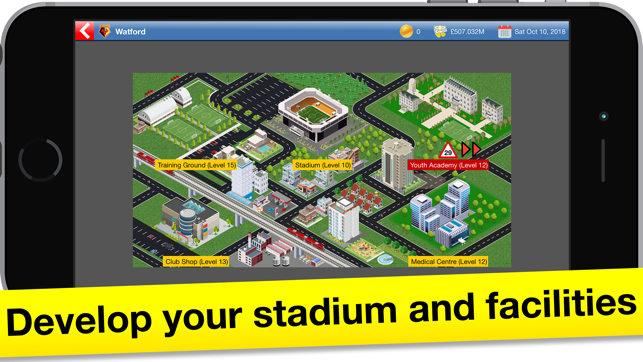 Continually level up your club’s stadium and facilities to help your club grow. The Stadium, Training Ground, Youth Academy, Medical Centre and Club Shop can all be expanded, allowing your club to rival the top teams in Europe. There are other personnel to handle than just the players. The Manager, Head Coach, Academy Coach, Physio, Head Scout, Youth Scout and Commercial Manager all play their part in the success of the club. 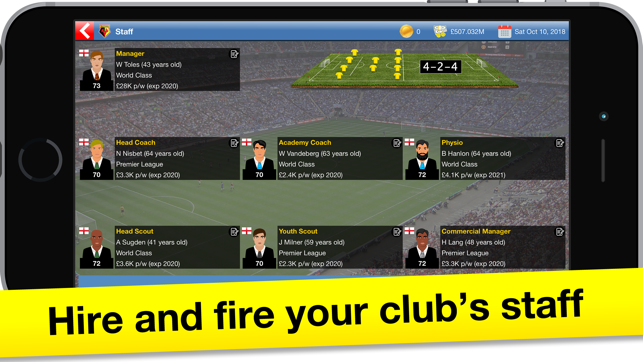 Hire and fire them at the right time to achieve the best results for your club. So will you be a prudent owner, investing in your club's facilities and nurturing young talent? 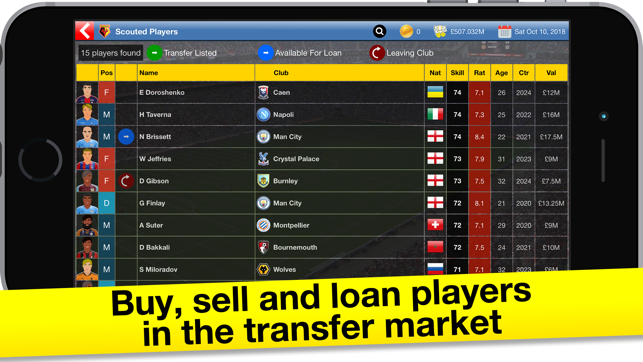 Or will you try and buy success, splashing the cash to sign top players for big money? 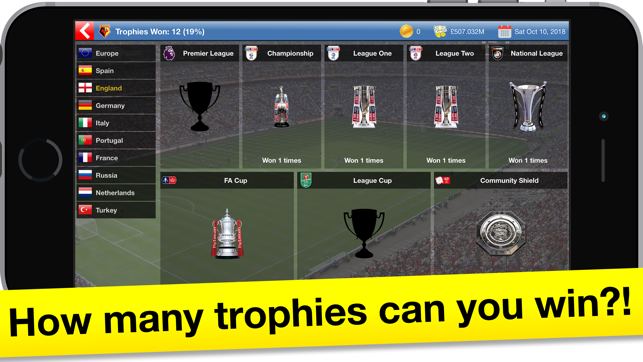 However you choose to run your club, the goal is still the same – win all the trophies and become the ultimate Soccer Tycoon. - Fixed bug where injuries did not heal during the off season. 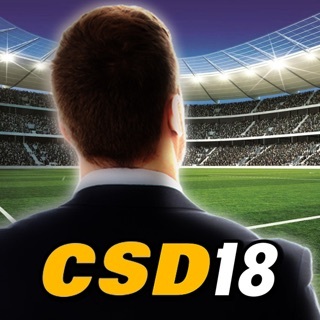 This game is pretty good and arguably one of the best free football managing games on the App Store, but there are some massive issues that really kill the game. •Why do I lose money every week in game during the off-season when I literally CANT play any games to make money back!? Please fix this massive issue immediately because it makes the game impossible to progress financially as I was in debt before I played even ONE game in my first season. At this point in my 5th season, I’m 700k in debt and have never even been close to making profit on a season. I understand losing money during away games on the season but NOT during the off-season. If this issue could be resolved it would solve the only issue I have in this game as the rest of my problems relate to this. • Why is there a massive gap between the end of December and March where there are no games played? It makes no sense that no games are played for months in the middle of the season, and I also still lose money every week during that break. • I’ve reached the point where since the finances are broken and I’m 700k in debt, when I try to get better players on Bosman Free Transfers they will agree to sign but the game blocks the deal because I can’t afford $0 to get a free transfer! These are massive issues, but the only issues I have with the game as the rest is very well put together and is a really good game. I’d greatly appreciate those changes, thanks! There are opportunities every 4 game weeks to watch a rewarded video for money. If you watch the videos, you will have plenty of money and this allows people to play for free. If you don't want to watch the videos but still want the money, you can buy the 'Remove Ads' IAP. I can only assume you are not watching the videos or haven't bought the 'Remove Ads' IAP. Do one or the other and your problems will be solved. I am using an Italian side that was in the fifth division. I now have the second most valuable club in the world behind only Barcelona. I’ve never made a champions league, or a Europa league, or even won a serie A title. In fact, never even finished higher than 7th in the league. Juventus wins every year (like real life) and I usually finish 30+ points behind them every year. I compared the two teams and I have a much better squad at every position than Juve but I can’t even challenge them. Juve’s top Gk is a 64 and mine is 77. Juve’s defense is 83, 78, 69, 68, 62, and mine is 79,78, 77, 68. Their midfield is 78, 75, 63, 59, 47 and ours is 83, 79, 78, 76, 76. Their forwards are 85, 72, 67, 65 and mine are 79, 77, 74, 73, 69. I feel top to bottom, I have higher rated players than Juve but I can’t even get close to them. That is frustrating and makes me wonder how results are decided. Seems that they’re random or more than likely, heavily skewed towards certain clubs. I rarely beat Roma, Napoli, or Inter, even though I have far better players than all those clubs. The problem I have with this is that it’s so hard to boost the value of the club, because the transfers are so unrealistic, you need 60 million to get a decent player, and I’m basically stuck right now with a low value for my club, I can’t boost it and so I can’t buy better clubs, although it’s definitely a better soccer management game than others, and maybe, I hope, you could do some manager mode where you can actually play the games, idk, I just wish I could. I have to disagree, the transfers are very realistic. You cannot expect to buy superstars all the time. Try buying some youngsters with potential, invest in your coaches and facilities, and patiently nurture them.